It would be exhausting to try to cover all the decorating efforts that are put together each year at Walt Disney World. Many of them have been evolving for decades, some are new, and all are great fun to see each year. We visited all of the parks and many of the hotels on property and picked our highlights for this year's holiday fun. If we missed one of your favorites, let us know. Shortly after Halloween, the fall decorations come down and the Christmas decorations are up. 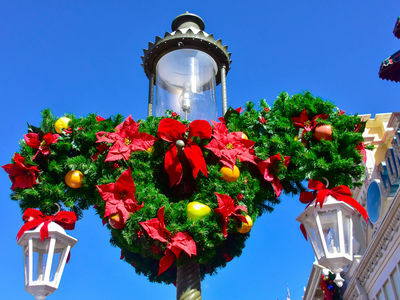 This process seems to happen overnight, and while the fall decorations at the Magic Kingdom are our favorites, it's fun to see how quickly the Christmas display unfurls. This year, the Christmas tree went up right after Halloween as well. We usually don't expect to see it until after the taping of the Christmas Parade, which takes about three days around the first part of November. 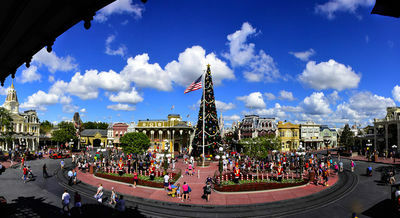 Christmas at the Magic Kingdom shows up right after Halloween in a big way with the decorations around the square on Main Street. Photo by Donald Fink. Wreaths adorn the lampposts along Main Street. Photo by Bonnie Fink. 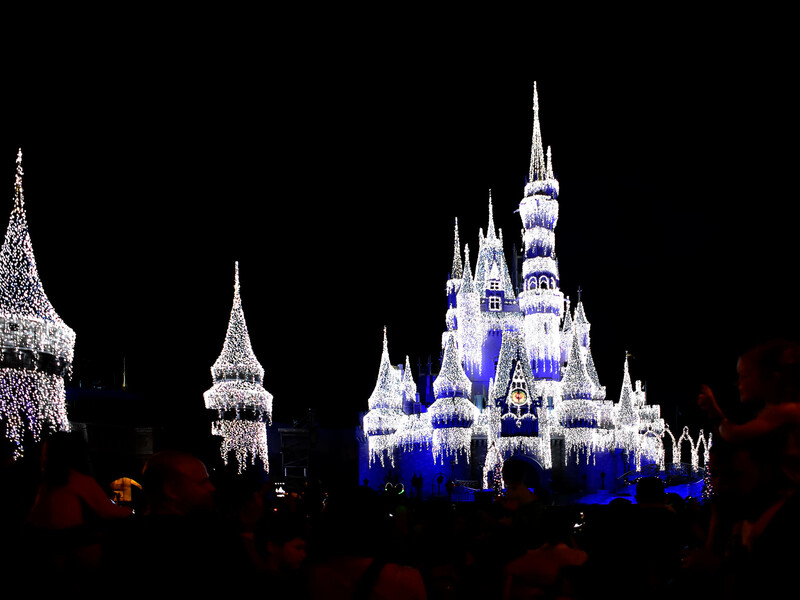 A favorite decoration around the holidays is the transformation of Cinderella Castle into an ice palace. Photo by Bonnie Fink. Hollywood Studios has a modest assortment of decorations all around the park, but the real show stopper is the Osborne Family Spectacle of Dancing Lights, located along the Streets of America. This display consists of over five million LED lights, strung up along the building facades, with rotating carousels, Christmas trees, and canopies of lights. The lights are choreographed with popular Christmas songs and literally "dance" to the music. There is nothing like it that we've seen anywhere. Unfortunately, after twenty years, this display is being retired by Disney. 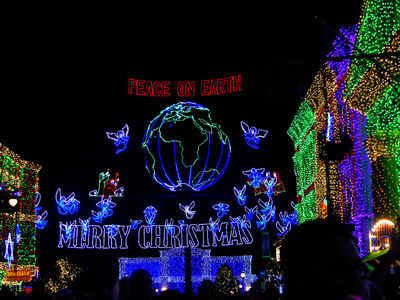 The angels that surround the globe appear to fly during animated sequences of the Osborne Family Spectacle of Dancing Lights. Photo by Bonnie Fink. 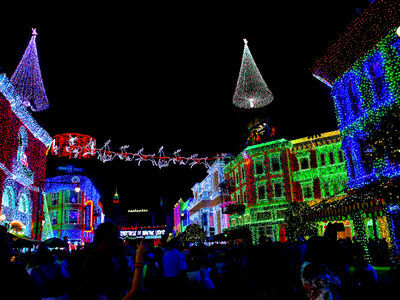 This will be the final year for the Osborne Family Spectacle of Dancing Lights at Disney's Hollywood Studios. Photo by Bonnie Fink. At Epcot, it seems like the International Food and Wine Festival ends one day, and the very next day the holiday decorations are up. There are topiaries at the entrance and at various locations around the park as well as a tree at the entrance to World Showcase. One of our favorite activities at Epcot during the holidays is the Candlelight Processional. This is a show in the American Gardens Theater at the American Pavilion in which a current celebrity narrates the Christmas Story. The narration is accompanied by a 50-piece orchestra and a large choir, including some of the performers from The Voices of Liberty Singers. The Candlelight Processional is a free performance with first come, first served seating, but another way to see this show is with a Dining Package. With a dining package, you can enjoy a dinner at one of Epcot's best restaurants, then get preferred, guaranteed seating for one of the three nightly performances. Whether you choose to take in the show for free, or with a dining package, be sure to get in line early. An hour early will usually do it, but maybe a bit more if you're planning on seeing the show for free. 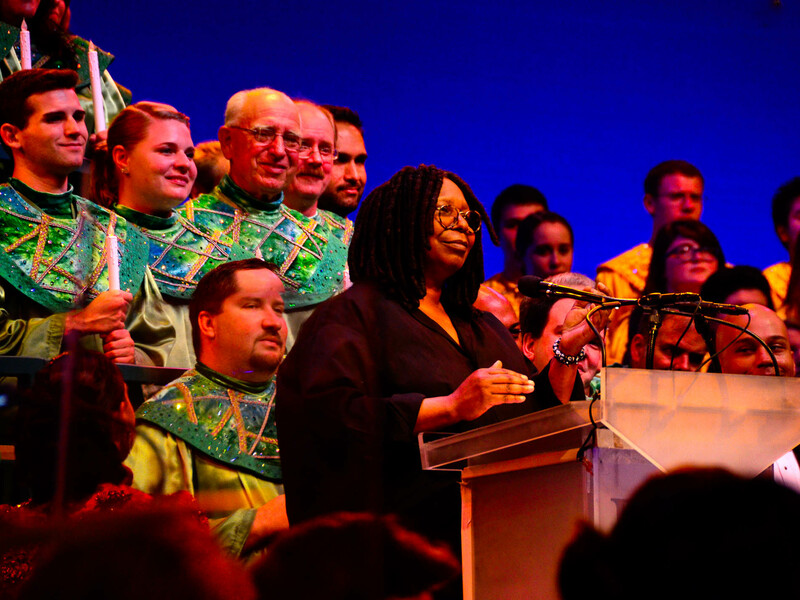 This is an extremely popular event that fills up with every performance—and it's worth it. The entrance to Epcot is transformed to Christmas with Mickey and Minnie topiaries greeting guests as they enter. This location is a favorite picture spot. Photo by Bonnie Fink. 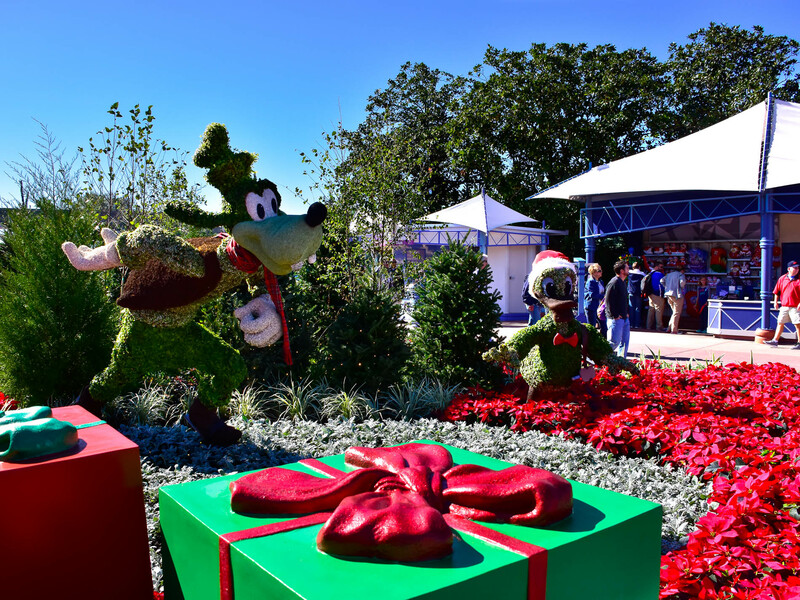 Behind Spaceship Earth, near the entrance to World Showcase, you'll find Goofy and Donald in a holiday scene. Funny how in this scene, Goofy appears to be skating, but during the springtime Flower and Garden Festival, he's positioning himself to kick a soccer ball. 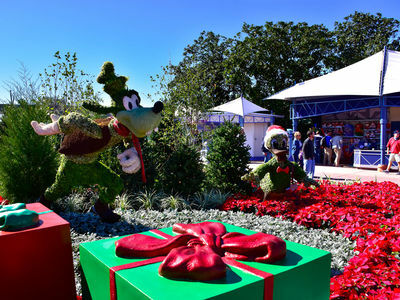 In years past, he has also made appearances at the Festival Center of the Flower and Garden Festival holding a pot of flowers in his right hand. Photo by Bonnie Fink. 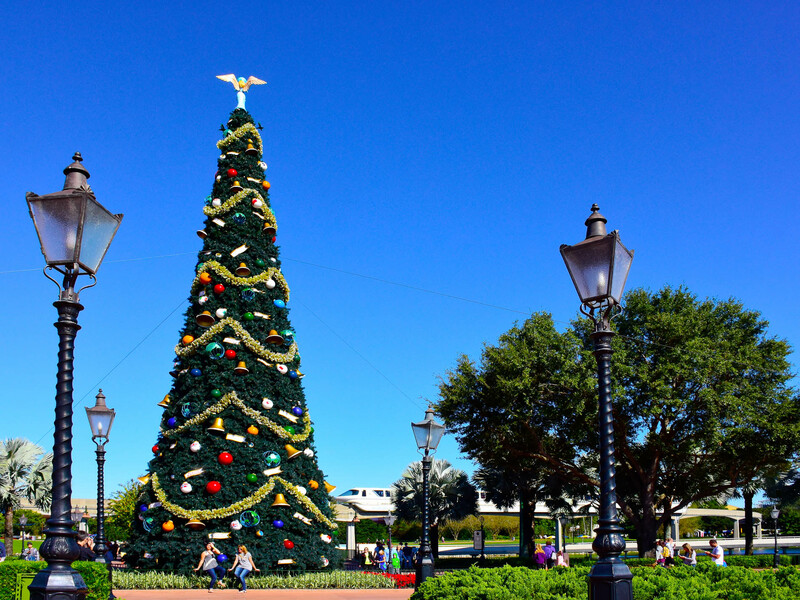 The Christmas tree at Epcot is at the entrance to World Showcase. The tree, appropriately enough, is decorated with Christmas greetings in all the languages from World Showcase countries. Photo by Donald Fink. Whoopi Goldberg is a favorite narrator at the Candlelight Processional; a Christmas story performed at the American Garden Theater. Photo by Donald Fink. 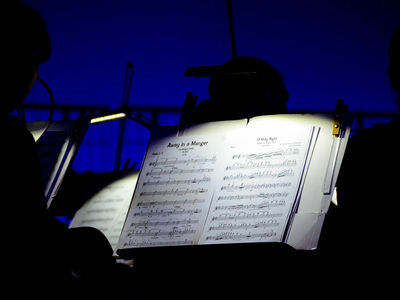 A fifty-piece orchestra performs Christmas classics at the Candlelight Processional. Photo by Donald Fink. 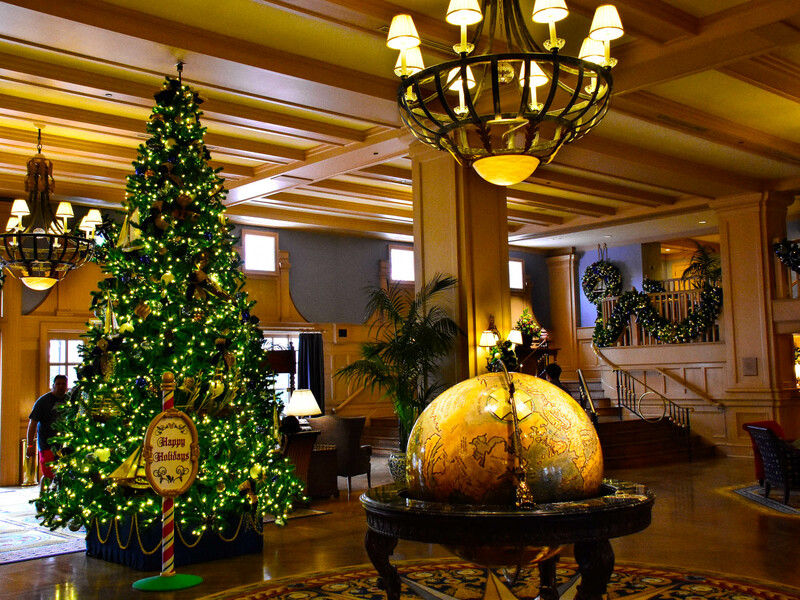 The Grand Floridian Resort and Spa is located along the shores of the Seven Seas Lagoon. 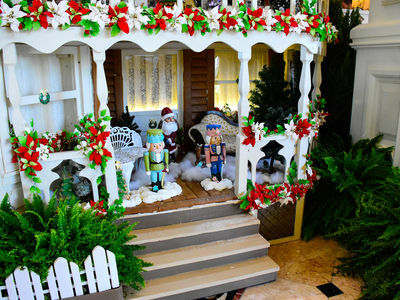 Their primary Christmas decoration is the gingerbread house located in the main lobby. This house has been displayed here since 1999. Austrian inspired, it contains 150 pounds of honey, 700 pounds of chocolate, 600 pounds of confectioner's sugar, 800 pounds of flour, and 35 pounds of spices. 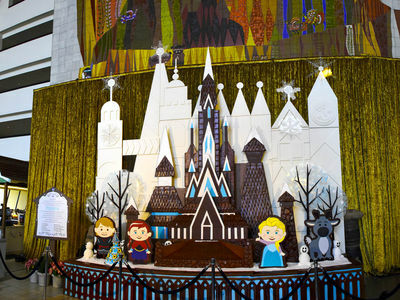 It's estimated that it takes 400 hours of baking to complete all the materials, and several days to construct. 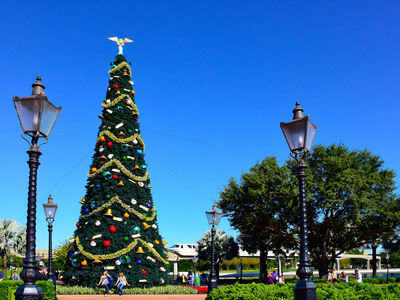 Of all the Christmas decorations at Walt Disney World, this is our all time favorite. 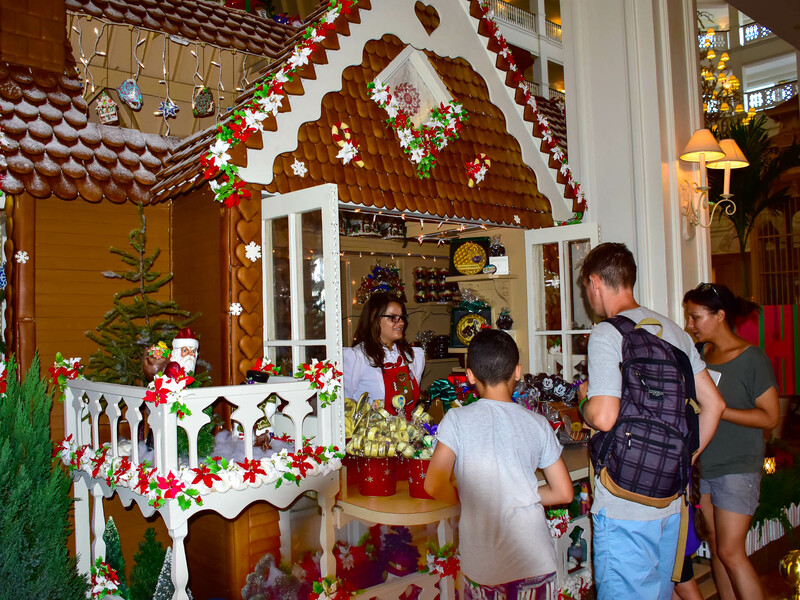 A favorite decoration located at the Grand Floridian Resort, the Gingerbread house doubles as a gift shop, serving various breads and confections. Photo by Bonnie Fink. A special feature of the gingerbread house is its stained "glass" made of sugar. 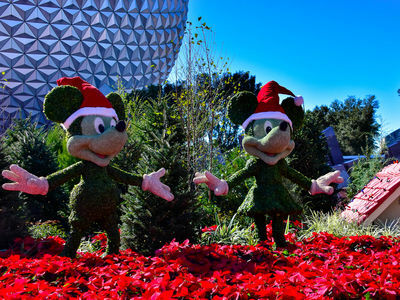 This Christmas scene features Mickey, Minnie, and the gang. Photo by Bonnie Fink. 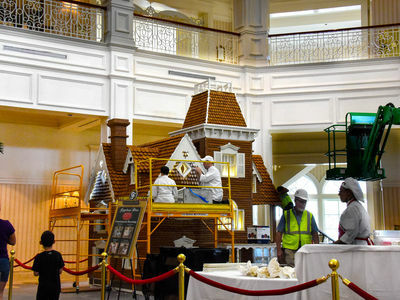 Construction of the gingerbread house at the Grand Floridian involves dozens of people, including electricians, mechanics, and the all-important pastry chefs from Disney restaurants. Photo by Donald Fink. This Austrian-inspired gingerbread house is made from over 10,000 individual pieces of gingerbread. Photo by Donald Fink. 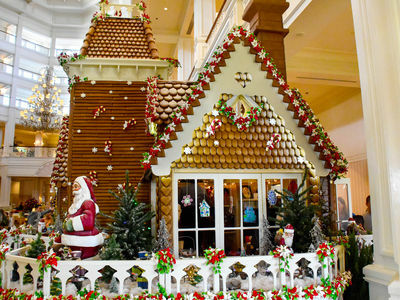 There are little "mini themes" around the gingerbread house at the Grand Floridian. If you're fortunate enough to visit this house, be sure to take some extra time to look at the details. Photo by Donald Fink. 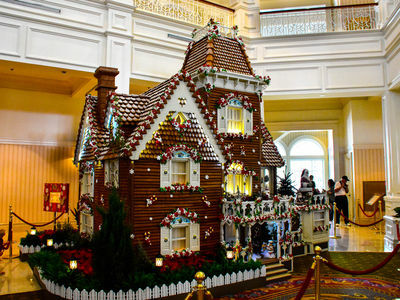 The gingerbread house at the Grand Floridian was originally built in 1999. This sixteen foot tall structure has been a favorite Christmas decoration and it is worth a side trip to see. Photo by Donald Fink. The Contemporary Resort has a newer, less traditional approach to their decorations, and the gingerbread display is no exception. This year they constructed a scene inspired by the art of Mary Blair featuring characters from Frozen. The characters Kristoff (left), Anna, Elsa, and Sven from "Frozen" appear in a style inspired by the nearby mural created by Mary Blair. Photo by Donald Fink. 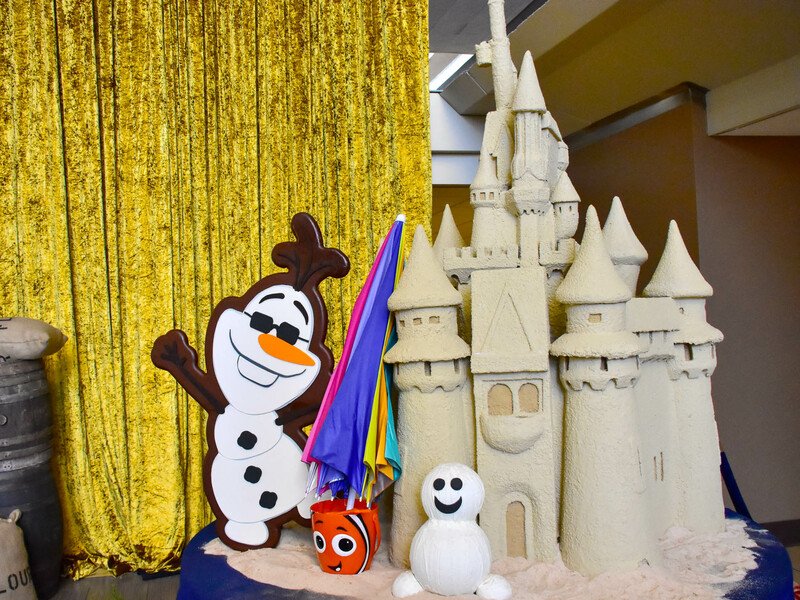 Olaf and a castle are part of the gingerbread display at the Contemporary Resort. Photo by Bonnie Fink. Olaf lollipops are for sale at the concession of the gingerbread display. Photo by Bonnie Fink. 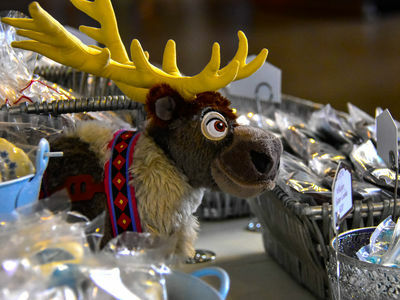 Sven is among the confection treats available at the gingerbread display. Photo by Bonnie Fink. 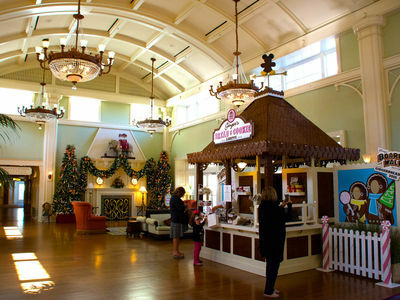 There's a new gingerbread display in the lobby of Disney's Boardwalk Inn, which is located on the Boardwalk behind Epcot. Inspired by early concession stands that were prominent along the east coast during the early part of the last century, this gingerbread house gets its architectural style from beach town inns and houses. It is more of an actual concession stand than a display, with gingerbread, cookies, and other holiday goodies for sale. It's probably not worth a special trip to the Boardwalk to see it, but if you happen to be passing by, it's fun to stop in and have a cookie. 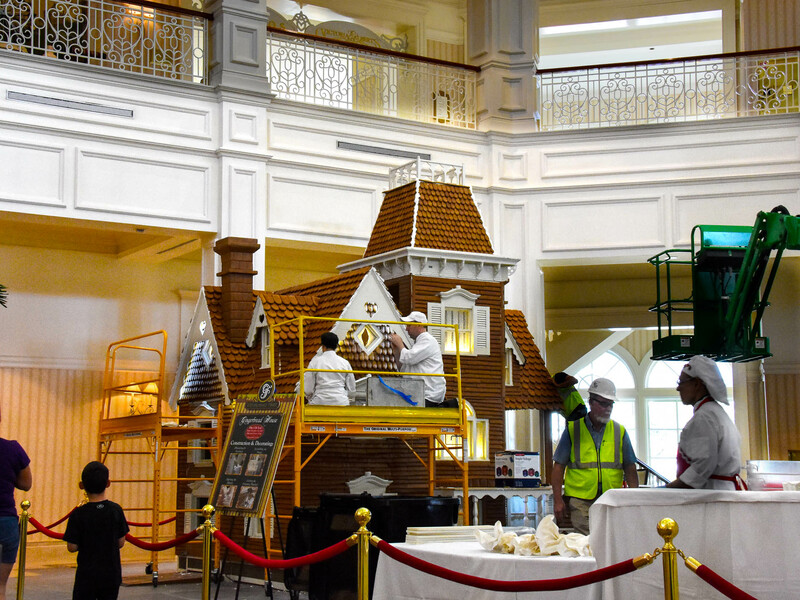 The gingerbread house at Disney's Boardwalk Inn is new this year. 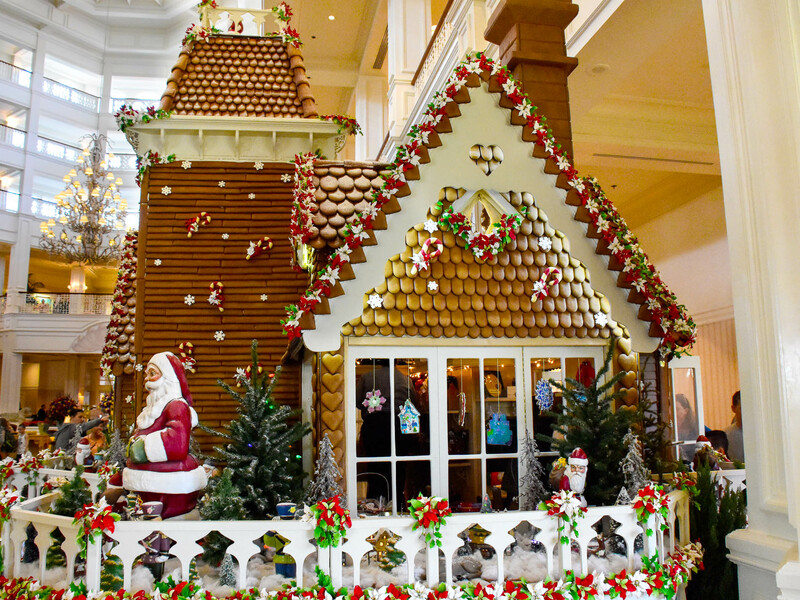 It is small, but still contains 350 pounds of gingerbread and 63 pounds of honey. 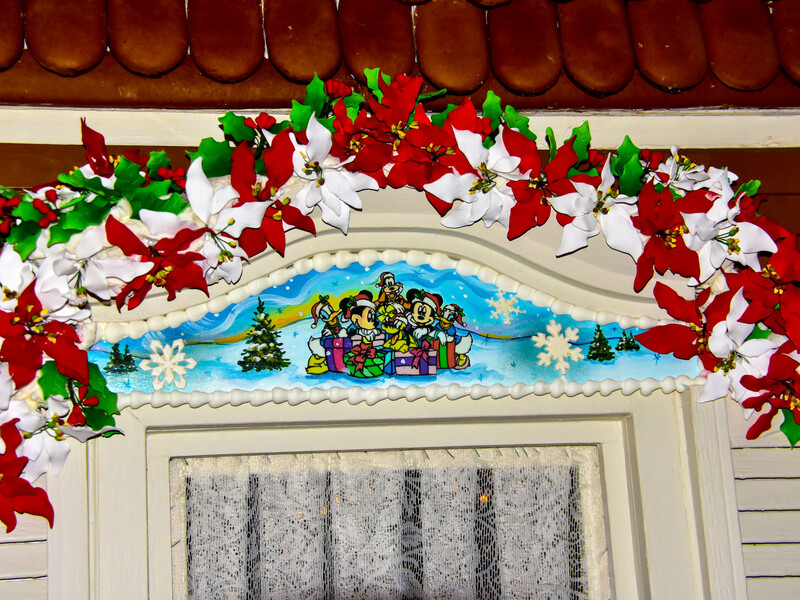 There are 124 Mickeys (not hidden) and 810 gingerbread shingles on this small concession stand, inspired by concession stands that dotted the east coast in the early 1900s. Photo by Donald Fink. 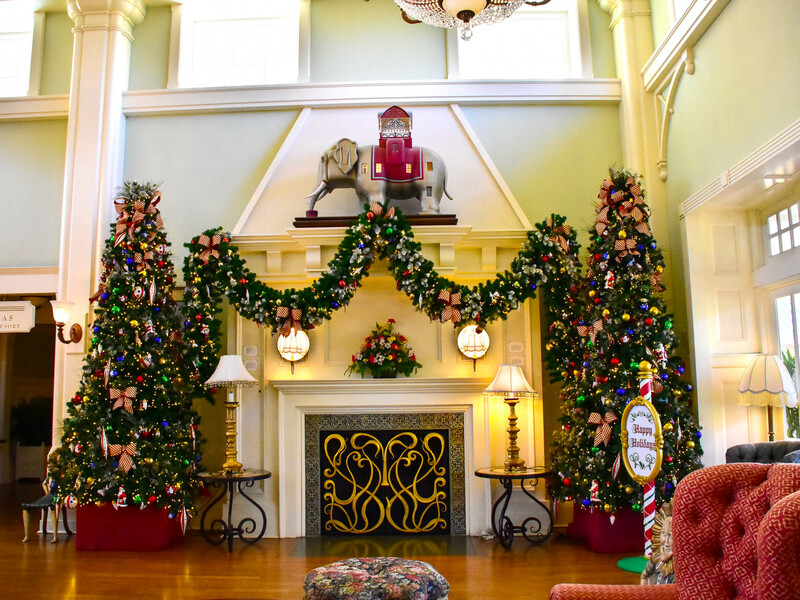 The fireplace mantel at Disney's Boardwalk Inn is fully decorated for Christmas. Photo by Bonnie Fink. The bakers at Disney's Yacht and Beach Club Resort prepare a gingerbread carousel that's displayed in the lobby of the Beach Club. The Beach Club is located behind Epcot, on the north side of Crescent Lake. You can't miss it if you're walking from Epcot. You'll see a large pirate ship near the pool and the walkway to the lobby is just before that ship. 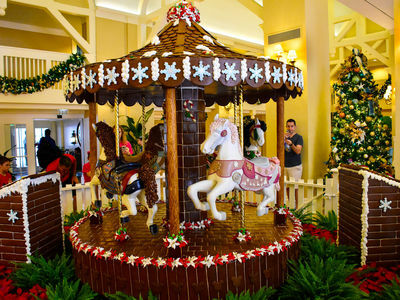 The carousel has four horses, and is made from 150 pounds of icing, 200 gum paste flowers, 36 pounds of eggs, 50 pounds of chocolate, and 2015 individual gingerbread shingles. There are also 16 silver hidden Mickeys. This is the sixteenth year for the gingerbread carousel and it's worth the effort to walk over and see if you're at Epcot. While you're there, if you can get a reservation, you might want to have lunch at Beaches and Cream Soda Shop; a mid-century styled beach town cafe that’s always a pleaser. The Gingerbread carousel consists of four horses. 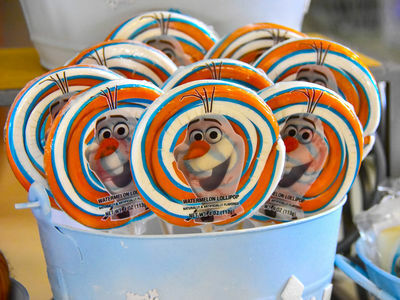 As it slowly rotates, you can try to pick out the sixteen hidden Mickeys. Photo by Donald Fink. The Yacht Club's Christmas tree is decorated with a nautical theme. Photo by Donald Fink.